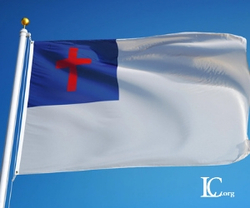 BOSTON, Mass., Feb. 5, 2019 /Christian Newswire/ -- Liberty Counsel has filed a brief regarding the city of Boston's censorship of a Christian flag which Camp Constitution requested to fly on a public forum, but the city denied the request. The city regularly extends to other civic and cultural organizations the freedom to raise their flags on the city hall flagpoles to commemorate whatever events are important to the organizations. The city's application policy refers to the flagpoles as a public forum. However, when Camp Constitution asked the city in 2017 for a permit to raise the Christian flag on Boston City Hall flagpoles to commemorate Constitution Day (September 17) and the civic and cultural contributions of the Christian community to the city of Boston, the Commonwealth of Massachusetts, religious tolerance, the Rule of Law, and the U.S. Constitution, city officials denied the permit based on a secret, unwritten and unconstitutional "policy" of refusing religious flags. In the lawsuit, Shurtleff and Camp Constitution seek an injunction requiring the city to allow the Christian flag-raising event, that it denied in 2017 and 2018, to coincide with the observance of Constitution Day. Liberty Counsel's Assistant Vice President of Legal Affairs, Roger Gannam, previously showed the trial court that the city's denial and secret "policy" are unconstitutional because the permit guidelines promise "to accommodate all applicants seeking to take advantage of the city of Boston's public forums." The city admitted in a court filing that its official policy is to make permit decisions based on whether the city approves the "message" of the applicant. The case is now before the court of appeals. "The city's blatant discrimination against Camp Constitution's Christian viewpoint is an unconstitutional censorship and insult to the First Amendment," said Liberty Counsel's Founder and Chairman Mat Staver. "Boston's rich heritage has a focal point of liberty and free speech at America's founding, and that cannot be denied," said Staver.